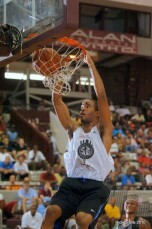 Several of the 2010-11 Duke Blue Devils participated in summer basketball events including the N.C. Pro Am and BDN breaks them down after multiple live views. There is no doubt that this coming season will be more than just a little entertaining as Duke will almost certainly be tabbed number one in the nation in the pre season basketball polls. While we realize you can tell but so much from summer basketball, after years of following the off season exploits of our players I have an idea of what to look for. BDN had representatives at all the N.C Pro Am games and off season camps, so our take is from in person accounts. Be sure to bookmark BDN for year round coverage of the Duke Beat and follow us on twitter and facebook for future updates. Mason Plumlee -Mason spent time in Chicago as a camp counselor in two events this summer. 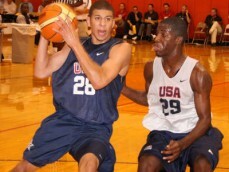 The first event allowed Plumlee to train with Tim Grover of Attack Athletes, who is infamous for tutoring Michael Jordan. Recently, Plumlee attended the Adidas Nations event where he was able to watch his brother Marshall who is Duke's most recent commitment. Mason also participated in the N.C. 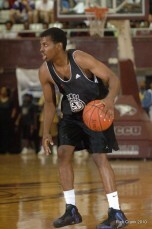 Pro Am where BDN took in all of his games. Plumlee showed off his athletic abilities and when talking with his teammates, they loved playing with him in that he often hit the open man with passes most big men cannot make. Plumlee is physically more mature and he's stretching his outside shot to the three point stripe, but he will be counted on more in the middle for Duke this season. Plumlee seems to be in great condition and had to play the whole game more often than not at the Pro Am. Players use the tournament to work on certain things and while Plumlee will have his back to the basket more often than not this season, he chose to work on his face up game. In short, he worked on the things he doesn't have a chance to as much in the system. A key for Mason this season will be his defensive footwork and positioning on post defense and you have to love the fact that he has a little nastiness in his game. 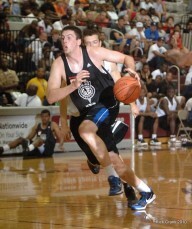 Miles Plumlee- Like Mason, Miles attended Adidas Nations as a camp counselor. This is an honor for they normally select the top college players for this role. Plumlee showed of a one handed push hook and worked on his outside shot during the Pro Am more-so than his post game. Still, Plumlee was depended upon for rebounding and there were several plays where he brought the crowd to their feet with his athleticism. Plumlee had a nice perimeter shot in high school and he is trying to get that back on a more consistent basis. He is most effective from twelve feet in and he doesn't have but maybe two pounds of body fat on his physique. Like Mason, Miles will benefit by Duke pushing the ball in an up temp style this coming season and pressure is sure to come the brothers Plumlee's way for they will be depended upon to anchor the middle all season long. The one thing which stood out to me in the Pro Am was the fact he never gave up despite having to play major minutes for a middle of the pack team. The key for Miles will be to bring consistent intensity and for him to realize he can do things few other players can. Andre Dawkins- It's almost as if you can count on Andre Dawkins to erupt every five games or so and he had one of those performances where he tossed in 36 points during the Pro Am. A shooter keeps shooting and that fits Andre perfectly. He still is dependent on the three ball to score more-so than moves to the basket and he has worked on his handle during the off season. Ball handling is vital for Andre to have the ability to take players off the dribble which will loosen up the outside for him. Dawkins role for the Blue Devils will again, a shooter but he has improved his footwork defensively and is capable of back side help. He is also a good finisher when in the open court and a solid free throw shooter but his passing skills need more development. 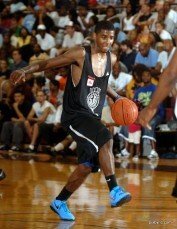 He will be the recipient of a lot of kick out passes when Duke's deep backcourt drives to the lane. Seth Curry- Silky smooth best defines Curry's game from my vantage. He moves in a very paced way which makes it look like an altered speed or slow on the surface. Or maybe I should say he weaves through defenders picking and choosing his spots? Anyhow, Curry is a scorer and his three point shot is solid as is his mid range game. He is a capable ball handler and he lulls his man to sleep as a defender allowing him to get in the passing lanes for steals. While not physically intimidating, he is a player you have to be aware of when he is on the court. Curry will not get as many shots as he did with Liberty with a talented Duke team and with that said, he could improve upon his passing skills in the open court. Everybody sees that his offense is solid, but major minutes will depend upon how well he does when playing off ball. The same can be said for the aforementioned Dawkins. Curry is capable of knocking down double digits this season for Duke and his game will thrive in the running style Duke will employ. Ryan Kelly -No player gained more off season hype than did Ryan Kelly who at 6-11 is now Dukes tallest player. What a difference a year can make with a young mans physical maturity and what you've heard about his weight gain is spot on accurate. The additional strength is helping Kelly where he often got pushed off the blocks in his freshman campaign. Kelly was named the winner of the Spirit Award given out by Rodney Rodgers. Kelly is not a big rah-rah guy and I was told the award went to him for his consummate team play and the fact his teammates loved playing with him. A more confident Kelly showed signs of a baby hook and he has a nice inside-out game going now and that will earn him significant minutes. No player appears to have worked harder than Kelly in the off season and he is certainly Duke's most improved player, or is he? Nolan Smith-While Kelly has improved, Nolan Smith seems to have found a whole other level for his game. Smith trained with the U.S. Select Team and that experience seems to have helped. Smith seems to be wanting a leadership role for Duke and he could not be stopped during his games at the N.C. Pro Am. He erupted for 43 points one evening and was essentially a human highlight reel when he was on the court. He left a lot of empty sneakers when slashing through defenders as if they were standing still and his shot was good. Really good. This led to him being named the events most outstanding player despite the fact he missed the last three games. Smith epitomizes how a player can improve each year in the Duke system to achieve their goals and remember where you heard it if Kyle Singler is the choice for Player of the Year, then Smith should be listed as 1-A. Quite simply, Smith is an All American in 2010-11. Kyrie Irving- It's as if we got a sneak peek at Kyrie during the Pro Am where he created quite the buzz with his effortless moves which dazzled the audience. It was no surprise to me for I have seen him do some amazing things on the AAU trail where I witnessed at least 20 games he played in. Go down the checklist ... ball handling, shooting, penetrating, playing the passing lanes, finishing and KI draws a straight A report card. What he can get better at is defense and once K works on that a bit more there will be no stopping him from achieving his goals. No if's ands or but's about the fact that a backcourt of Smith and Irving will be the nations best and Irving brings mad skills to the table. He will make everybody on a talented team better with his ability to break people down off the dribble and he should dish for a lot of dunks to his teammates. Irving didn't play down the stretch in the Pro Am and that is probably all by design but his 30 plus point efforts had Duke fans grinning and opposing fans looking forward to hearing his name be called one day by the NBA commish in New York. Josh Hairston -During the opening night of the Pro Am, Hairston struggled against veterans Josh Powell and Courtney Fells but that is the kind of learning experience these games provide. Some guys would have crawled in the corner but Hairston turned it around and averaged 14-15 ppg the rest of the way. Hairston loves the drop step and the turn around fade away jumper. He is not a real physical banger type but he is a well rounded front court player who could be depended upon in his first season with certain match ups Duke will face. Hairston showed steady improvement during the N.C. Pro Am event and he adds depth to the roster. Tyler Thornton -It seems Thorntons play surprised everybody during the Pro Am, but not me. I have known all along that Thornton is underrated and he plays completely within his own skill set making him a steady player who will not hurt his team with turnovers or forced shots. The knock on Thornton was his outside shot but he improved upon that and showed it hitting three consecutive three pointers to open the event. Thornton is a confident player who is a nice addition to the team. 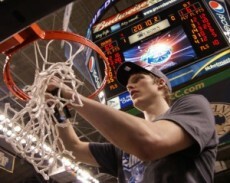 Kyle Singler -He was held out of the N.C. Pro Am and who could blame Duke in that he was the Final Four MVP and the odds on favorite to win national player of the year going into next season. Singler attended several camps including the LeBron James skills academies and most recently practiced with the US Select Team coached by Krzyzewski.